A few months ago I needed a salad to bring to a party. Not only do I hate showing up empty handed, but it’s always best practice to bring something you know you can eat when you’re trying to eat healthy. 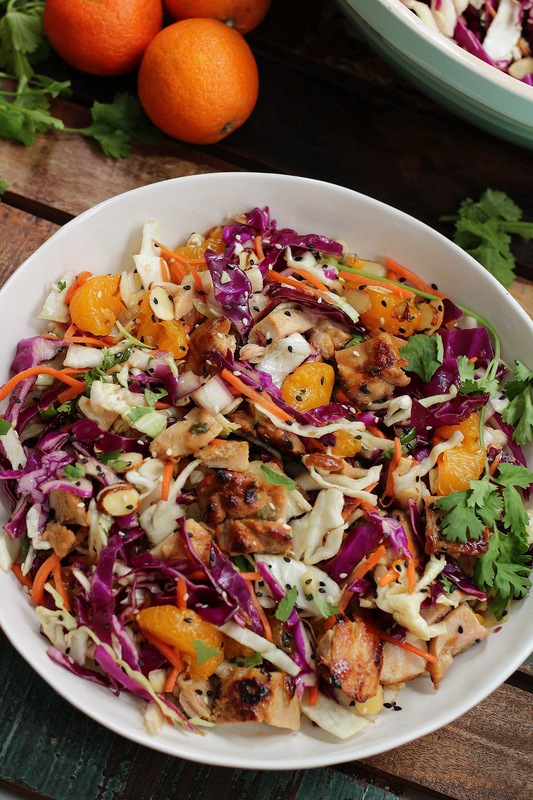 This salad is always a crowd pleaser. It’s also a pretty quick one to make in a large batch. Almost all of the ingredients I used I ordered from Thrive Market which makes feeding a crowd (or making a ton of meals for myself) really cheap. Plus they offer 20% off of your first 3 orders which is a deal that’s hard to pass up. If you don’t like a heavily dressed salad, wait to add the dressing until you’re ready to eat. I just mix it in a glass Pyrex bowl that I can bring with me along with the Tupperware the salad is in or store in the fridge. If you want the cabbage to absorb the dressing and become more of a coleslaw, add the dressing in and refrigerate for a few hours before serving! It’s awesome either way! Stir in dressing well and enjoy! My family was tired of the chicken recipes we usually ate and wanted a change. I made this and even my kids loved it! Instead of just mixing the dressing in, I left it on the side so we could put a little on it in case it was too strong for them. My son went back and got more with even more dressing on it and mixed it well. We ate this with homemade potato salad. My hubby couldn’t wait to take it for lunch the next day! I will be making this again! Oh, and we used gf soy sauce since I couldn’t find coconut aminos… delicious! YOU GUYS I ALMOST CRIED THIS IS SO GOOD! Definitely one of my top recipes and will be making this over and over again. Thanks Bailey! This looks so good! About how many servings would you say this makes? Thanks! Hey! Honestly this makes a LOT of salad haha! I’d say probably 6 servings if had as a meal, much more than that if had as a side! I’m excited to make this recipe this week! I don’t have any avacado oil- do you think that olive oil or grape seed oil would taste ok as a substitute? Thanks!! Made it with olive oil tonight and it turned out deliocous! This salad was almost too beautiful to eat but wow am I glad I did! 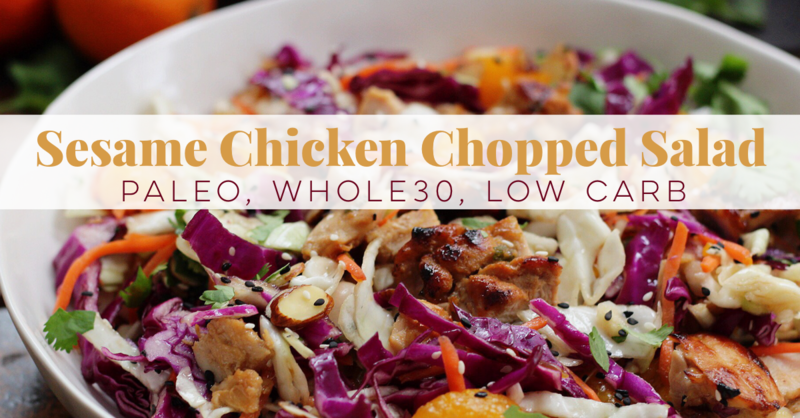 New favorite Whole30 recipe!! I’m so glad you loved it! Thank you! 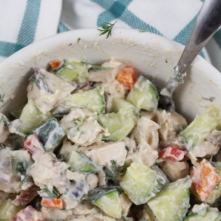 Omg this tastes exactly like the Asian chicken salad I used to eat at Wendy’s every day (when I was 18 and fast food salads were the peak of my healthy eating). It is so delicious! 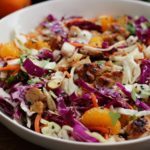 I love the crunch of the almonds and the dressing is great as well. Always looking for non mayo slaw recipes. Thank you! This was so good I had to leave a review after I raved about it on insta stories. What would be the equivalent amount of bagged cole slaw mix? I have 2 bags, so you think that is enough? Yeah! That should be good! I often just use a bag of green cabbage and a bag of purple, so I think 2 bags of coleslaw would be fine! this recipe is a slam dunk – made it to take to a pitch-in, and it was one of the first things to run out! 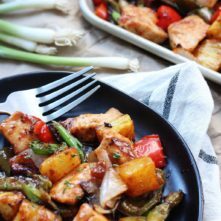 people loved it (paleo & non-paleo alike), and are still asking me for the recipe! I also made it to meal prep & it holds up well over the course of the week in the fridge. Hmmm don’t have toasted sesame oil ???? Can I just omit it?? Also don’t have black sesame seeds so should I double the white ones?? You can use regular, not toasted sesame oil if you have it, or replace with avocado or olive oil. And yes! I’d just double the white sesame seeds 🙂 The black ones mostly just make it look a lil’ fancy, doesn’t alter taste! Enjoy!! Where’s the nutritional value breakdown? I don’t calculate macro info, but you’re welcome to use My Fitness Pal or whatever nutritional calculator you use for your meals! This is a great recipe! I used walnuts instead of almonds. I will definitely make this again and again again. Appreciate the share! So happy you enjoyed it! Thank you for coming back and letting me know!! So Delish! Making it for a family gathering next weekebd. Can’t wait to try with grilled chicken this Summer! ???? I’m SO happy to hear this!! Thank you, Tammy! 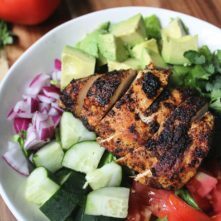 One of my all time favorite Whole 30 recipes! Thank you! This is a delicious salad, but is it Whole 30 compliant with the sesame oil? Sure is! 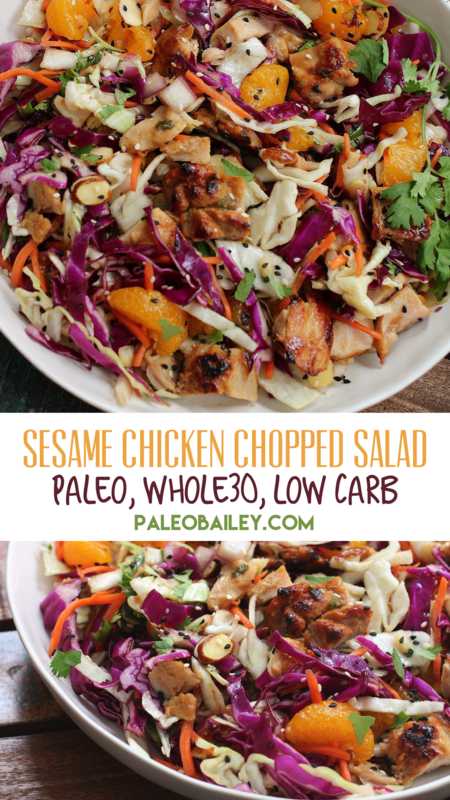 Sesame oil is Whole30 compliant. How many servings does this make? Looks yummy! This sounds great and I can’t wait to try it. The only questions I have is do you have any idea what the calories are per serving and how much is in a serving? This is hands down my FAVORITE recipe on Pinterest!!! We have it at least 2-3 times month. Super easy and DELICIOUS!! SO happy to hear this!! Thank you, Melissa!